Now that you have both the Radio and Sound Card FOB wired up and your Raspberry Pi on hand we need to tie everything together. Most of the articles I found put the required Fob to Radio interface electronic components in-line with the wires to the radio or the sound fob. 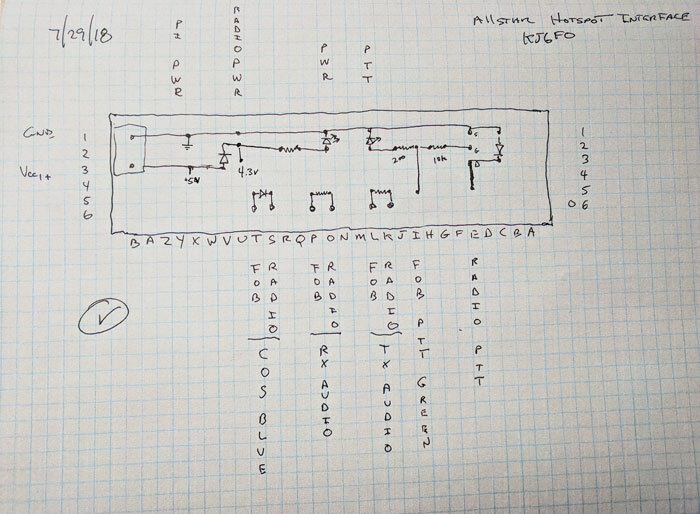 Since my build is going to be boxed into a single enclosure, it will have plenty of room inside, so I elected to build a separate board that would connect the radio and fob together as well as handle the power connections. This board is the “glue” the connects the separate parts of the system. The wires from the radio and sound fob are attached together via this board. This board also has LEDs to indicate power and PTT status. It also has a power connector for 5v input and produces a lower voltage required by the BF888s radio. Layout of components on perf-board. Interface Board in the middle. This picture shows the board with two power drop diodes on the board. 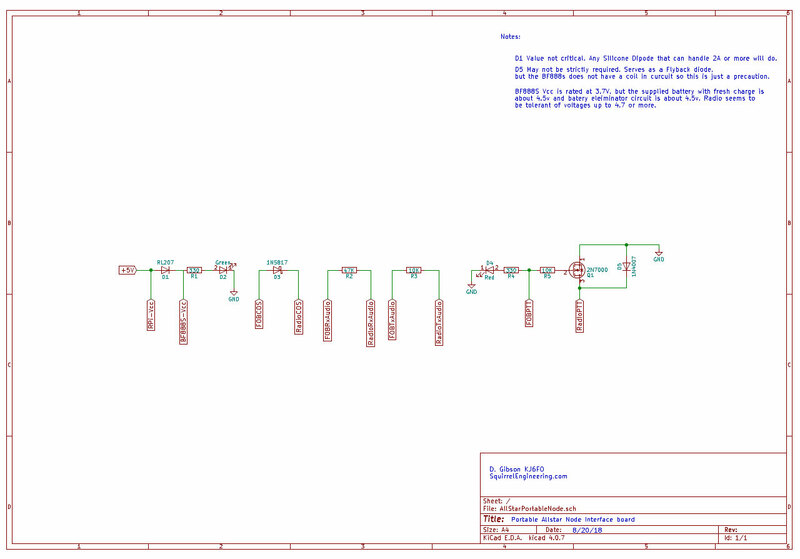 Use only one diode required per the schematic. To power the Raspberry Pi a 5v supply is needed, but the radio operates at a lower voltage so a voltage drop is needed. 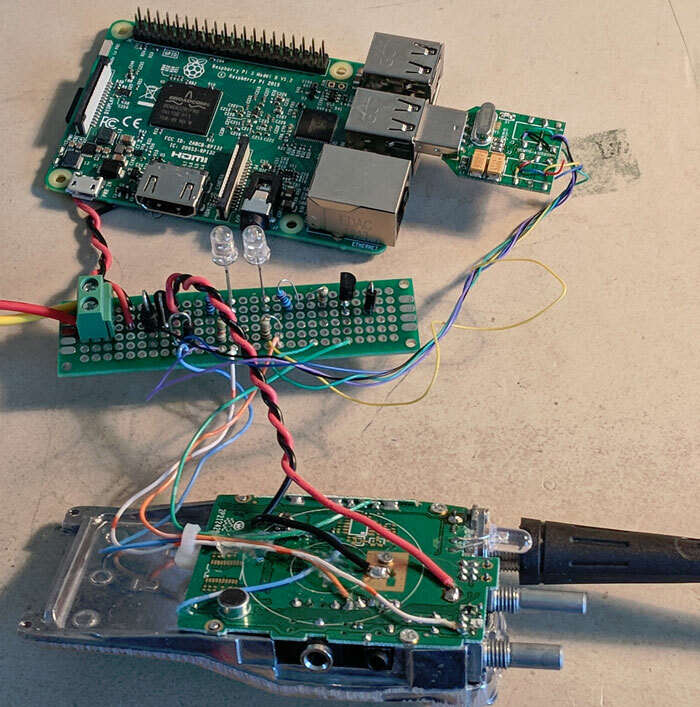 The 5v power source is connected to the Raspberry Pi to power it up. A diode (D1 RL207) is used to drop the voltage for the radio. The BF888s is rated at a 3.7 volt input, but I found that a fully charged battery is 4.2 volts and a battery eliminator made for the BF888s actually outputs 5 volts. It seems that the radio’s input voltage is flexible. D1 drops the voltage from the 5v supply and powers the radio. I tired two diodes to make a larger drop and the radio started acting up, so I went back to the single diode. Most any silicon diode will work as long as it has about a 0.7v drop. Since the radio can draw about 1 amp, the diode should be rated at 2 amps or above. The diode does get warm on a long transmit, but not alarmingly hot. Finally, the power is sent through a green LED to indicate that power is on. The PTT circuit uses a 2N700 FET transistor used as a switch. When the FOB PTT line goes high it turns Q1 on which will connect the radio PTT line to ground, keying the radio. The FOB PTT line will also light a Red LED to indicate that the radio should be transmitting. Diode D5 protects the transistor from inductively induced current (Flyback) that may come from the radio. For the BF888s radio , since it does not seem to have coils inline with the PTT, this is probably overkill. The COS line from the radio passes though a reverse biased diode D3 to the fobs COS line. The diode protects the sound FOB from any large current that may be on the line from the radio. Resistors R2 & R3 are used to set the RX and TX audio to appropriate levels for the FOB & Radio. You can fine tune the levels withing the Allstar software if needed. To finish off the circuit, I added an Anderson power pole connector to the input side of a 12v to 5v buck converter and this allows me to connect the rig to any convenient 12v power source in my shack (All my shack power uses Anderson Power poles) I also constructed a cigarette lighter plug to a power pole connector so I can run the node from the dash board plug. It is time for Pi! Lastly the Raspberry Pi is connected to the 5v power from the interface board. While the Pi has header pins labeled 5v and Ground, it is not advisable to connect power directly to these pins. They were designed for output voltages. Connecting power to these pins leaves the Pi unprotected from voltage spikes that are likely to occur in a near RF environment. The Pi is normally powered from a micro USB connector which supplies the required 5v. This input is protected from nasty voltage surprises, so it is the preferred way to connect power. 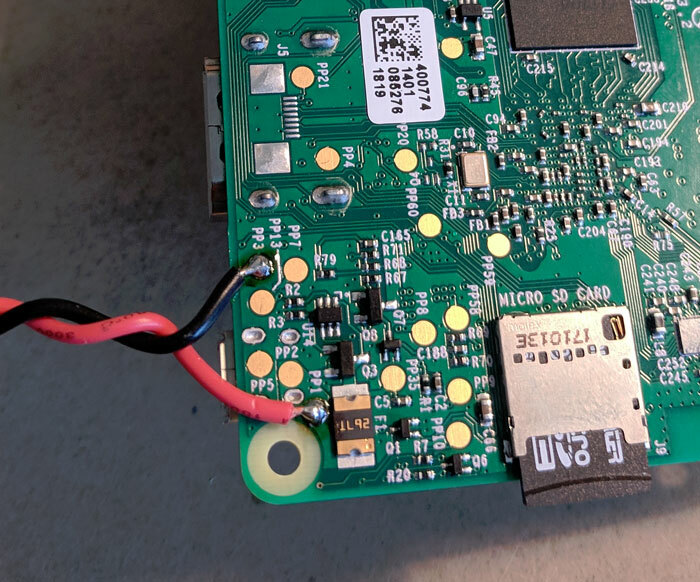 However, I do not want to bother with a USB connector, so I directly soldered the power wires to the underside of the Pi. +5V connects to the PP1 pad on the RPi and Ground connects to PP3. Use caution when soldering the 5V line as the PP1 point I soldered to is surrounded by ground plane and could easily result in a short. After soldering check the resistance between your power and ground and make sure it is not at or near zero ohms (i.e. short). Once the hardware is setup, installing and configuring the Allstar software is next. This process is described in this article. Before you download the software and install it, go onto Allstartlink.org and create an account and request a server and node (as described in the linked article). It may take a few hours to days before a volunteer configures your node and assigns a node number to you. So get this process underway soon as you can. Run though the set-up procedures as described in the set up article. I was leaving on a trip shortly after building my Allstar Hotspot, so I just threw the node into a Tupperware type box and plugged into my 12V dashboard power port (i.e. Cigarette lighter socket). This worked very well, but it is not as robust as I desire for continuing travels. So the next step is to build an enclosure to make the Allstar Node truly portable.